Put this set on my deck outside of my bedroom doors for morning coffee and they are perfect! They seem to be high quality wicker that will stand the test of time - they will be on a covered patio so that should help. Clean lines, very attractive. Enjoy the comfort, style and quality of this Matura 5-piece outdoor club chair set by Corvus. Constructed of heavy-duty aluminum and resin wicker, this club chair set is durable for lasting use. The cushions feature UV protection to prevent fading and extend the life of the set. With two decorative pillows, it turns your outdoor space into a luxurious oasis. "is there a sectional/couch that matches this?" Hello, hchristmann. This set does not have a matching sectional. 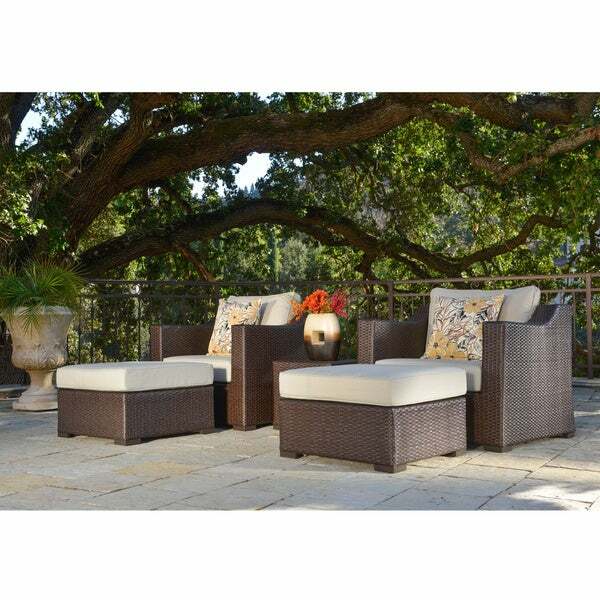 However, we do have a wide selection of outdoor sectionals, found here: http://www.overstock.com/search?keywords=outdoor+sectional&SearchType=Header. Thank you for shopping with us. Check out Sirio model #EC005. it should be just what you are looking for. Hello Hchristmann, you can find "Coordinating Items" to get some matching sectionals on this page .